Last November, while I was at Woodworking In America, I participated in a class on Western saw design. When preparing for the class I tried writing notes on how saw teeth work and I got totally bogged down. Everything is intermingled. 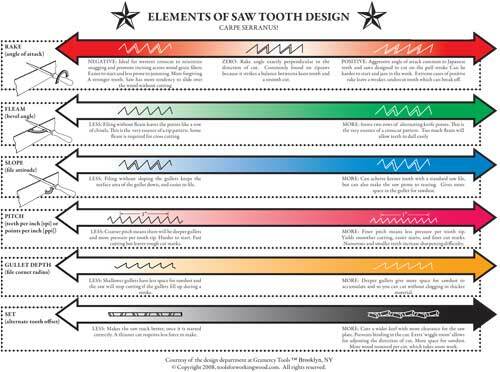 Aside from explaining the terms used in saw tooth design you have this whole question on why we make a saw finer or coarser, the effect of changing the angle of the teeth, and all the other factors that influence how a saw cuts. So at the end of the day we came up with a chart that shows how it all works and we think this makes the terminology a little more comprehensible. Download the chart here. I hope you find it useful. Great stuff, Joel - very helpful. Thanks for taking the trouble to prepare the chart. Thank you for assembling this information is a concise and easily understood format. You have deftly combined clarity and ease of use. Thanks a lot for the chart. It is great information. I recently bought the files and saw sets from you. This chart has made everything a whole lot clearer. Thanks for the education. Between tripling my saw knowledge and your sharpening primer I feel that I have to go buy something. This won't be hard since you've got a great selection and and competitive prices. This is my first visit but not my last. I echo the comments already made. Just now came across this when looking at your saw vise. Thanks for making it available in such a concise chart. Joel, thanks so much for putting this together. It is a great reference for the effects of changing your tooth geometry. 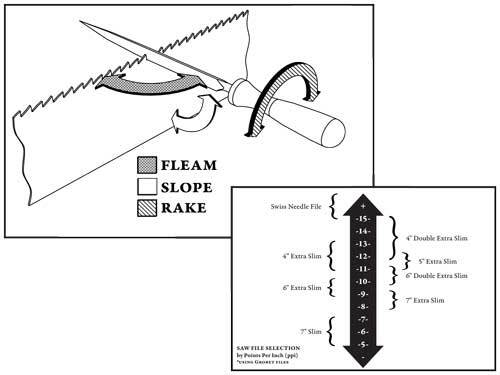 I have actually linked to this chart for my students in my Hand Tool School.